Definition at line 105 of file d3dx9anim.h. Definition at line 107 of file d3dx9anim.h. Definition at line 111 of file d3dx9anim.h. Referenced by D3DXFrameDestroy(), D3DXLoadMeshHierarchyFromXInMemory(), load_frame(), and queue_frame_node(). Definition at line 110 of file d3dx9anim.h. 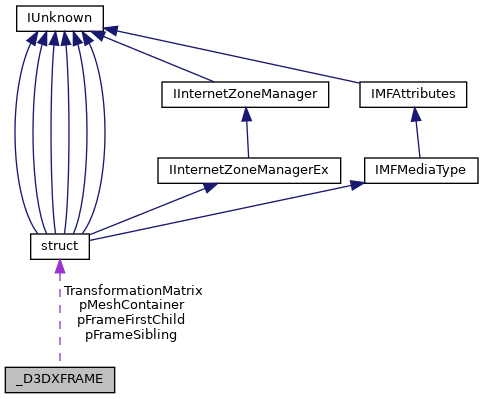 Referenced by D3DXFrameDestroy(), D3DXFrameFind(), D3DXLoadMeshHierarchyFromXInMemory(), and load_frame(). Definition at line 109 of file d3dx9anim.h. Referenced by D3DXFrameDestroy(), and load_frame(). Definition at line 108 of file d3dx9anim.h. Referenced by D3DXLoadMeshHierarchyFromXInMemory(), and load_frame().